My thanks to Steve and Timi at MX Publishing for my review copy of this book. You guys rock! I will admit to a lot of disappointment in this book. I really wish I had read a few reviews before requesting the first book and its two sequels. Then I would have probably not cost my sponsors at MX Publishing the cost of the trilogy. Sherlock Holmes is far from the only sleuth to be written about in Victorian London. There were many contemporaries. Some did build on the foundation laid by Sir Arthur Conan Doyle. I am reminded here of 1 Corinthians 3: 10, the Apostle Paul speaking:  According to the grace of God which is given unto me, as a wise masterbuilder, I have laid the foundation, and another buildeth thereon. But let every man take heed how he buildeth thereupon. Other sleuths in harness at the same time as Holmes included Baroness Orczy’s The Old Man in the Corner and Skin O’ My Tooth, aka lawyer Patrick Mulligan. Both of these characters are unique despite their being created by the same author. I would not work at all to try to leverage one character’s stories into the style of the other. I enjoy them both, just as they are. 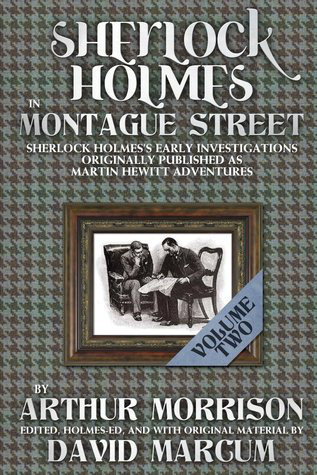 Thus when I think of Martin Hewitt, who’s adventures were written by Arthur Morrison, I don’t see the advantage of translating them into Holmes stories. Hewitt was not Holmes; neither in habits or detective ability. Much of Hewitt’s charm was working his way into a suspect’s good graces by his open friendliness. Holmes could charm when he had too, but he could also be ruthlessly cutting even to his only friend, Doctor Watson. That said, despite the cleverness of David Marcum in recreating the Hewitt stories as early cases of Sherlock Holmes, I feel it doesn’t really work that well. The stories were fine on their own, and that will be the way I remember the twenty-five stories over three volumes—tales of Hewitt, not Holmes.